Busch Gardens: Divided into seven awesome sections, Busch Gardens is a theme park lover’s paradise! Owned and operated by SeaWorld, this theme park is well known for its unique collection of rollercoasters including the Griffon and Apollo’s Chariot as well as the technology darkness ride, The Curseof DarKastle. Busch Gardens is a great place to bring your group for a day of free time and fun. Air and Space Center: For those interested in science and innovation, you have come to the right place! The Virginia Air and Space Center features multiple exhibits of flight and space travel replicas and history as well as an IMAX theater, research center and much more! Water Country USA: Everybody likes a waterpark! Owned and operated by Seaworld, Water Country USA is packed with great rides and slides such as the dark and mysterious Aquazoid and the Jet Scream inner-tube slides but that’s not all…….Water Country has Virginia’s largest wavepool with waves towering at four feet high! 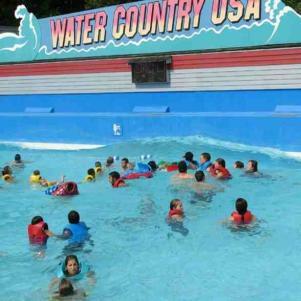 Your group will not be disappointed by Water Country USA. Other Activities: Other activities include but are not limited to tours of historic and educational Colonial Williamsburg, Yorktown, the State Capital, and Monticello, the famous home of Thomas Jefferson, drafter of the United States Constitution. If you really love amusement parks, there is a smaller Virginia Beach Amusement Park located on the boardwalk that has several rides and attractions. Though it is not a Busch Garden or Six Flags, it is a neat experience to get a feel for Virginia Beach. Whether it be the beauty of the beach or the fun of the activities, you can’t come to Virginia Beach without having a great experience!